Hi there:) I am excited to share a new dress design I sewed up last week. I am naming it the Miss Polly pinafore and dress. I made this one for Emily as she only has a couple of winter dresses that fit her. 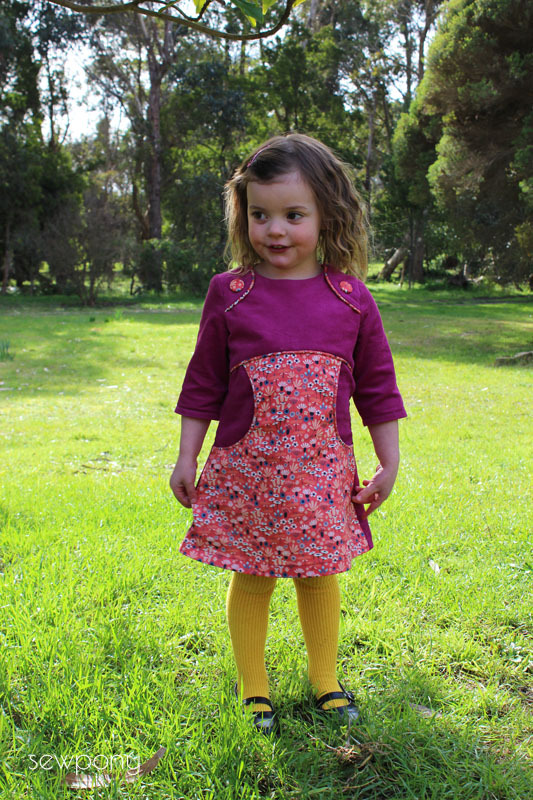 This dress is inspired by this dress I made a few years ago for Juliette. It features the same shoulder flaps (that my sister designed) and I wanted to work out a way to incorporate a big pocket in the dress. So the arched yoke and curved apron pocket evolved. The pocket lining does not extend all the way to the hem as that would make the pockets to deep and a bit impractical. 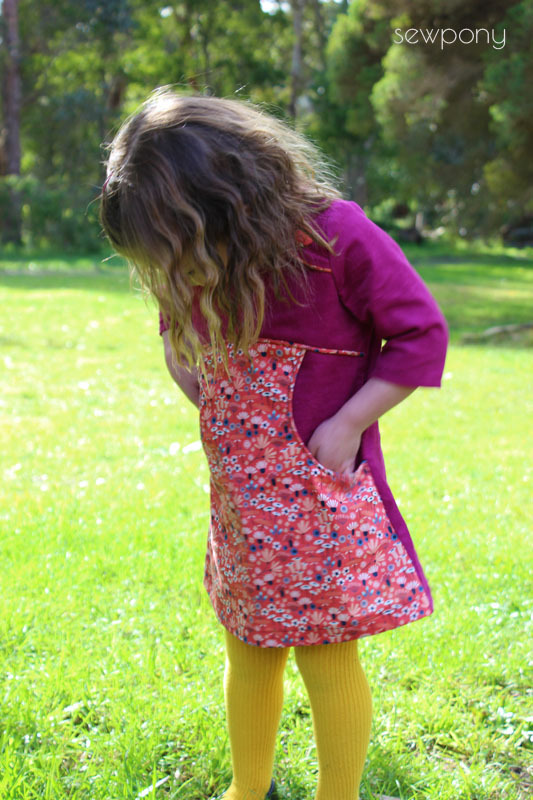 The dress again features piping (I love piping) around the bottom of the yoke, the pockets and the shoulder flaps. 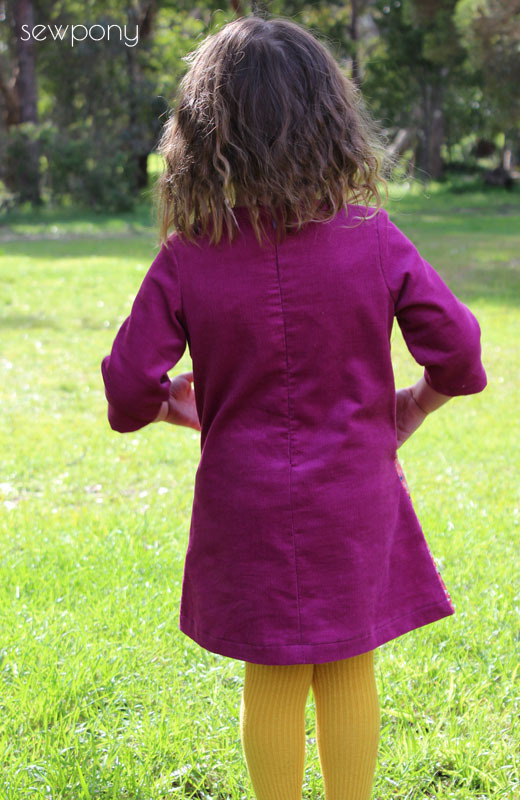 For this dress I used a lovely soft pinwale corduroy and some beautiful Cloud 9 floral (from the Wildwood collection) designed by Elizbeth Olwen - both from Spotlight (on sale - yay!!). I am lucky to have Spotlight around the corner and they stock lots of Cloud 9 fabrics. The blue colourway of this print is gorgeous too. The whole dress including zipper cost around $11. The dress closes with an invisible zipper at the back. Ten minutes after these photos, Emily fell in a muddy puddle and dirtied this dress up - oh well - that's what playful dresses are for, right? There are two more views for this design which are both suitable for warmer weather and this view will be available in three quarter or full length sleeves. This pattern is in very early stages but keep an eye out for more versions and progress! PS. I am on instagram (@sewpony) now so if you are over there - please say hello! 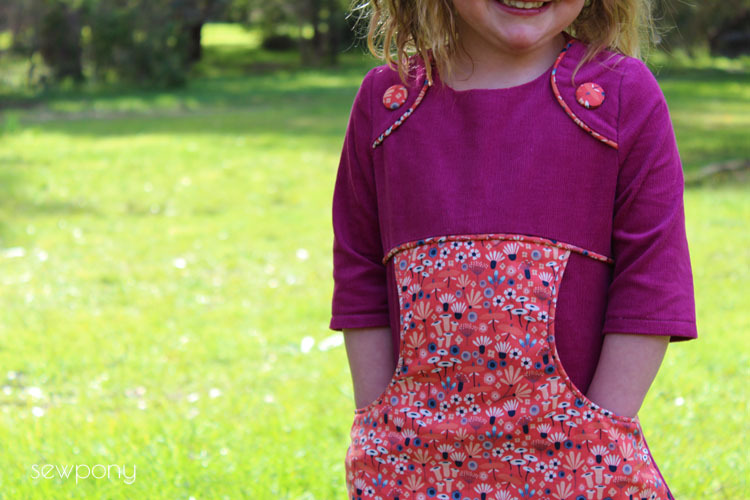 Too cute, love the big pocket and the shoulder flaps! This is lovely! Wouldn't it be possible to loose the zipper by making the flaps fully functional? A loose sizing for the waist would be necessary, so might not be possible, but when I saw the flaps I thought no-zipper. This dress is so perfect! I can't wait for the pattern, I'm sure my little Liv will be beautiful with it. Oh Suz, that's such a pretty dress. I'm totally in love with the whole design! Totally want a german version ;) Especially since it has also long sleeves for nice fall/winter dresses! Ah, the flaps, the pocket, the yoke - sooo good! Ok suz ! thanks for the replay ! I'll keep an eye on your store ! Such a beautiful design! 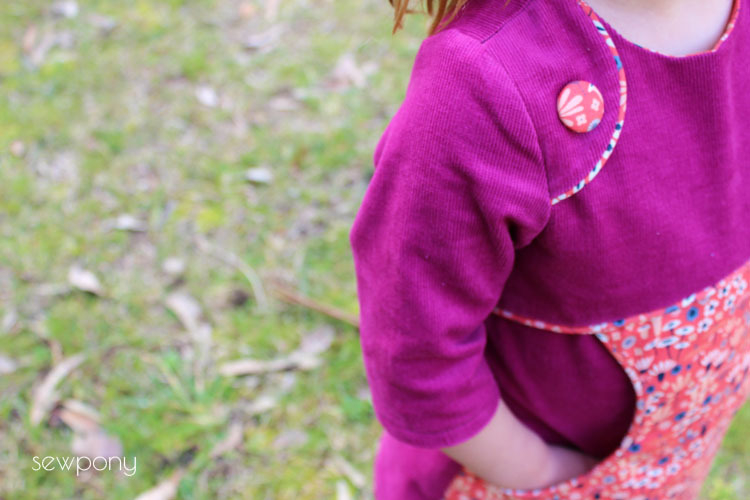 Can't wait to sew one for my daughter. OHHH, this dress is adorable!! Just gorgeous! Love those details. 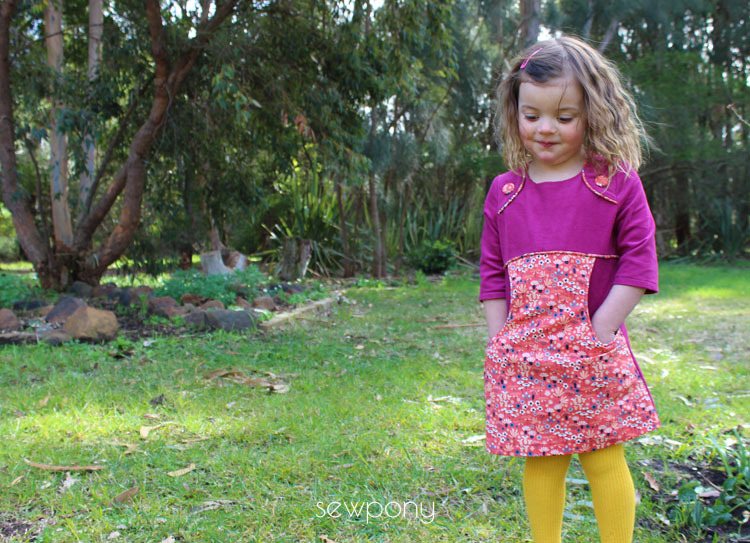 I've just made a couple of dresses in Wildwood too, I think it's one of my favorite fabric collections! Loving it! Look forward to hearing more!! This is so perfect just the way it is! I am so glad it has a zipper. I have a granddaughter with Cerebral Palsy & having the zipper makes it so much easier to put it on her. If it didn't have the zipper, she wouldn't be able to get it on. Thumbs up from my sweet granddaughter who loves to wear dresses! Suz, this dress is simply stunning. Love the curved lines. A job well done indeed!